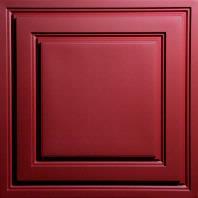 This garage is anything but boring with Ceilume's bold Stratford Ceiling Tiles in Merlot! Here are a couple of photos of my installation of the Stratford tiles with a CeilingLink grid system in my garage. This is an unheated garage in upstate New York, and Ceilume was one of the very few panels I found that can handle the range of temperature and humidity, and far and away the most reasonably priced. Your service and product are excellent, installation was a breeze, and I look forward to doing business with Ceilume in the future.